Perfect blue skies and Beinn Alligin was just shouting out to us. Parked at the car park above Torridon House and headed up the track on the east side of the river in Coire Mhic Nobuil. Crossed the river and followed the branch of the path northwards towards the Horns of Alligin. There was a lovely scramble up dry rocks to a point where the path branches to pass over or under the 'Horns'. Little Mitzi had to be lifted up the bigger steps so we opted to save time and follow the very exposed path under the pinnacles. 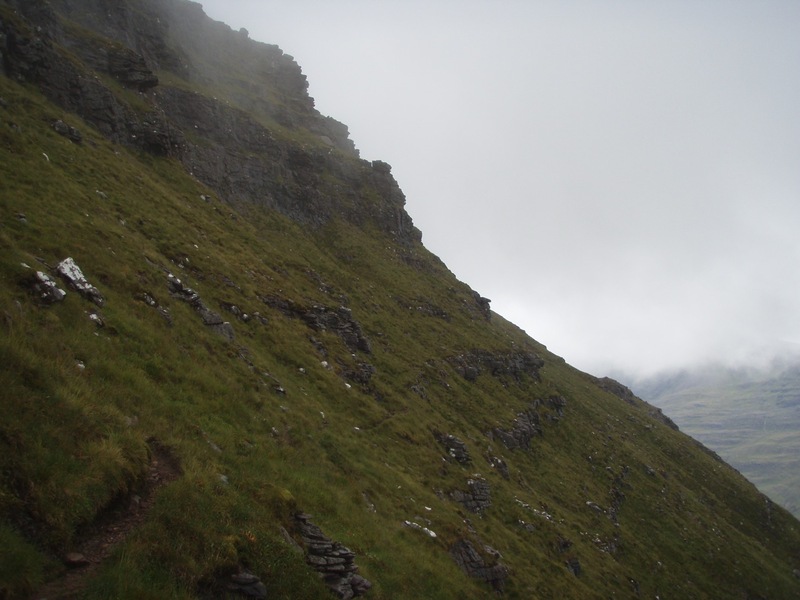 The path then runs up a ridge to the higher of the two Munros, Sgurr Mhor. Had been wondering how we were supposed to cross the great cleft of Eag Dubh when viewed from Liathach on the previos day but all was revealled as we moved on and found ourselves crossing behind it! A long walk along a not very scary ridge took us to the other Munro, Tom na Gruagaich. Lots more food. I had been worrying about the steep path in Coir' nan Laogh in case it was loose scree but those industrious path builders had been there before me and it was more of a staircase for the descent. Now the view of the Liathach ridge is so good I'm annoyed I didn't go there today!! Good to see some pics of the actual scrambling and such a good description from someone obviously not over-confident (like myself). Very reassuring about the descent from Tom na Gruagaich... maybe not quite so reassuring about the 'horns' bypass path being exposed - I rather thought it would be but people keep telling me it's easy! 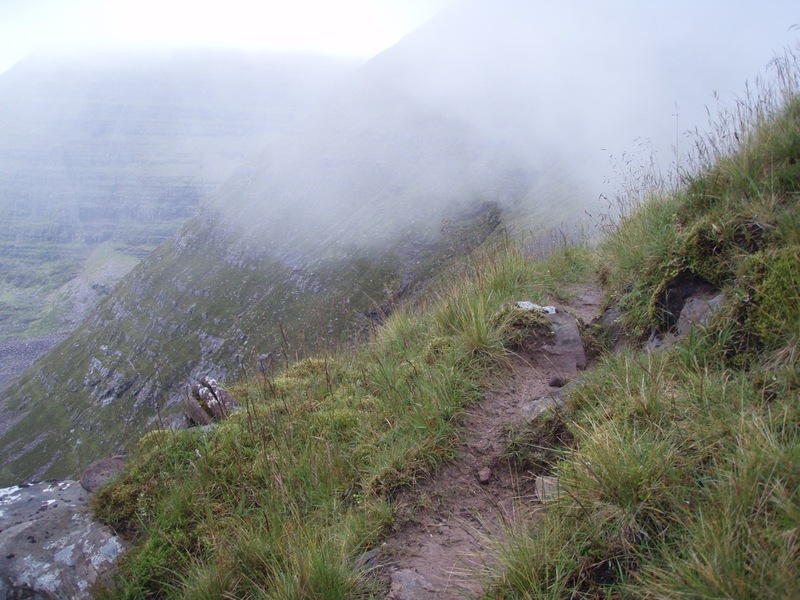 The path is wide and stable and doesn't feel unsafe but it is a sheer drop if you look down........just don't look down! Don't worry, I won't... a bit like the traverse path on An Teallach then around Corrag Buidhe - I was fine on that as the path was wide and stable like you say for this one... thanks for that. Just love the first and last pictures. I agree with you about Liatach Looks like you had the right weather to do either ridge today. I had heard that the main danger with the traverse path was slipping on the grass and not stopping. Did the grass seem slippery? Probably not in that weather, but maybe so in other circumstances? If you mean the path along the side beneath the 'Horns', then it was quite deeply cut in and sandy, not at all grassy, so no chance really of slipping there. The ridge is grassy but broad so no chance of slipping down the hillside there either. There had been constant rain for days before the walk but the sandstone rocks produce sandy paths which seem to drain pretty well and the rocks themselves were not slippy even when wet. The ground is pretty steep around the path, and it is a gritty affair with grass both sides. You can make it out here. Wow IanG, if you take piccies of all the paths it must take hours to download all your photos! mc, we did the Horns in quite claggy weather and really had no problems with it, but do note that at one stage you do need to look carefully for the route, but it was all an easy clamber for us. I imagine that the route would be easier to find in good weather, though the drops on either side would be more obvious! I understand that you and I have different attitudes to our relative abilities and desires, but I suspect that the over the top route might be within your abilities if it is within your determination and courage. (If others who have done this think I am wrong, please speak up). My abilities are fine - it's my courage which isn't unfortunately I have some good days though where I would probably sail along it but unfortunately few and far between. And I prefer a clear day as, if it's misty, I imagine things are much worse than they really are!